So last week I did the review of the Mini Mum on Friday because it was Friday the thirteenth and that went well with the horror/monster/Halloween theme. 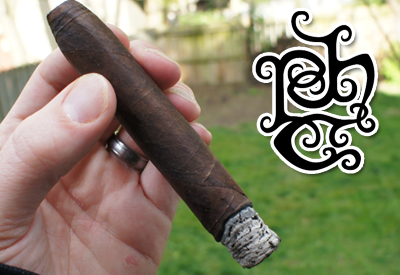 Today I'm doing the review of the Lil Drac not for any other reason than I wanted to smoke it. Out of all of the new Little Monster cigars, the Lil Drac is the one that intrigued me the most. I've always found myself I little out of the norm on the overall public feeling on the original Drac release. 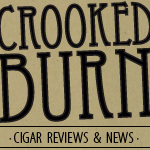 To put it bluntly, I liked it a lot and almost all the other people I have talked to about the cigar have ranging opinions from "It's just OK", to "I though it was bad." Yes, the original release had issues with the packaging (not the look, which was awesome), but after I stored the cigars outside of the box for a bit, I really thought they smoked great. Just another case of to each their own. Two things I want to point out about the wrapper on my Lil'Drac. 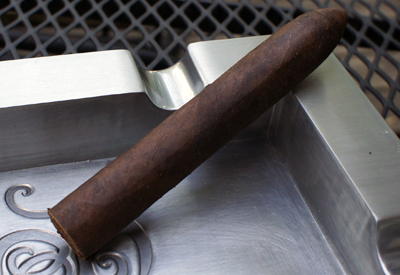 First was the color, which was fairly dark, but had tons of tiny lighter dots all around the cigar. If you have smoked the full size Drac, you might remember this look. Second was the pre-lit aroma. This cigar smelled unbelievably good. The aroma consisted of leather and a sweet citrus smell. Those descriptive words don't do it justice. When you get your hands on one, take extra time to enjoy the pre-light. The cap was not as torpedoed as the original Drac but clipped easily and the cold draw was on point. The flavors I got from the cold draw were a sticky candy-like sweetness, again mixed with a lot of citrus notes. Lighting this little cigar was no problem. It immediately produced lots of thick smoke. Just like the pre-light aroma, the resting smoke coming off of this stick smelled wonderful. It made me wish that I had smoked this cigar inside and not on my back deck to fully enjoy the aroma. Oh well, next time. The first inch or so of my Lil'Drac had a lot of a mellow cocoa flavor on the front which mixed in with an interesting twang. More on that later. The finish on each draw was full of black pepper, but not really a hot black pepper, just the taste. Side note: Contrary to what I just wrote, if you push this smoke through your sinuses it's damn hot and spicy, so proceed with caution on that front. 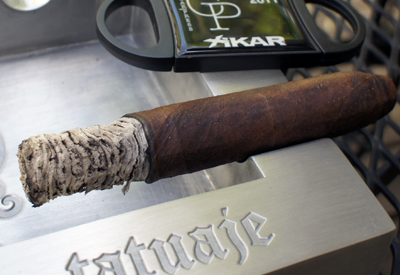 Getting into the halfway part of the cigar, the interesting twang really picked up and started to dominate not only the front of the profile, but also creep into the finish. I would describe it as a generic acidic citrus taste, but mixed with a cooling mint flavor -- not like an Altoids sugar added mint flavor, but more of a natural, maybe even mint tea taste. The nicotine strength was in the medium range. The second half of my Lil'Drac had a little change up with some flavor, but again mostly dominated with the twang from the end of the first half. What is worth mentioning is I started to get some leather notes on the finish which, although didn't seem like it was needed, added some more interest. Another fun thing worth mentioning was after I took a drink of water, the flavor in my mouth tasted a lot like milk chocolate. Totally weird I know, but hey - stranger things have happened. The nicotine strength never pushed above the medium range, so this will be a stick that I think almost anyone aside from the new smoker could handle just fine. I did have a bit of a crooked burn that I had to correct once, but that could have been due to the windy conditions of the day. 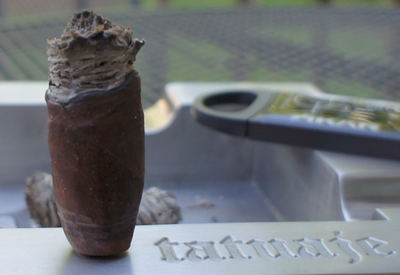 Final thoughts on the Tatuaje Lil'Drac ? Good cigar with one of the best smelling wrappers I have ever experienced. I know it's a common wrapper that is used on a lot of cigars, but I've never had one smell this nice. The flavor profile is enjoyable and I think the twangy taste people will pick up will cause a lot of good discussion around the B&M and message boards. I love the original Drac and I'm glad the Lil'Drac did not disappoint.